Every child – every child – is a journey, and this trip is really complicated because so little is known about the natural course of this emerging epidemic in each individual. For example, if an observant, smart, but relatively non-verbal person is placed in an institution among children who have chromosomal and other devastating syndromes that result in mental retardation, their resulting development may appear to include a low “IQ”, as a self fulfilling prophecy, not a scientific certainty. This limitation in the literature – that present research outcomes are based upon the diagnosis and treatments which were available 15 years ago – could possibly account for the discrepancies of opinion between parents of autistic people as opposed to the current beliefs held by many pediatric neurologists. Will my child always have diabetes? It will require a special diet, special instruction for the schools, and special medications. “But those kids are going to develop normally”, insist many ASD affected parents. Look, I don’t want to get off on a tangent here, so suffice it to say, when your child has it, it’s important. 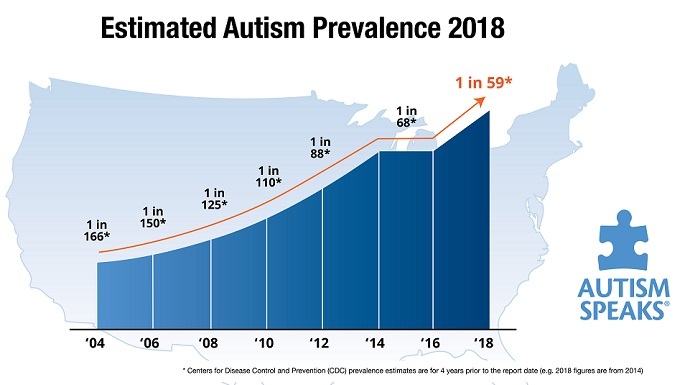 My point is, for autism, at least the kind that appears related to the neuro-gastro-immune causation, the parents’ job is to get an early diagnosis, a good biomedical practitioner, all of the appropriate behavioral therapies and do what it takes to get development on a typical course. In the first encounter with an asthma patient, the doctor must, first of all, achieve an accurate and precise diagnosis. That is followed by a search for the cause, if possible. Treatment plans follow as a logical protocol. Autoimmune diseases follow a unique overall progression and personal course. Many asthma patients appear to outgrow it. However, the condition may re-emerge much later. Or, the individual may be at increased risk for other autoimmune diseases. Hay fever mostly seems to come and go. Lupus has an up and down flow that, sort of, percolates along. Rheumatoid arthritis is sometimes unremitting, unrelenting and destructive. In the future we will probably call the condition “ASD Type I or II” or whatever because we will not only recognize the different medical entities, but understand why different protocols are more or less successful in particular patients. What makes us especially concerned about how long the child will have any condition? It determines the extra resources that will be required, the priorities that a family will reassign, and the hopes and wishes that we seek for our children. If we assume that an ASD patient can make progress and live a “normal” life, we go a long way to helping that vision. What difference does it make as long as the child continues making progress, really? The Diet? Oy vey. OK, the kids are gonna cheat and sooner or later the gut gets happier. Most supplements will make their usefulness known to the parent, and eventually to the patient. And then, maybe I’m wrong. Perhaps it’s not an autoimmune disorder or a chronic condition but a totally reversible condition that is due to Herpes Virus Type 99 or Vitamin X Deficiency. That would be really great. In the meantime, there is ICD-9 code 299.01: Autistic Disorder residual state – to shoot for. This entry was posted on Sunday, April 17th, 2011 at 11:58 am	and is filed under >ALL<, Alternative and Complementary Medicine for ASD, Chelation, Diets, Patient experiences. You can follow any responses to this entry through the RSS 2.0 feed. You can leave a response, or trackback from your own site. International Classification of Disease, 9th edition. A standardized classification of disease, injuries, and causes of death... into a number, which allows clinicians... and others to speak a common language.